I am not sure who printed these cards. It could have been Jon and Kim’s dad. I just don’t know. But it seems unlikely that a club owner would print something like this to hand out to its customers especially since it also advertises another venue below the Ranch’s ad. Both Port Byron and Milan are near the Quad Cities. 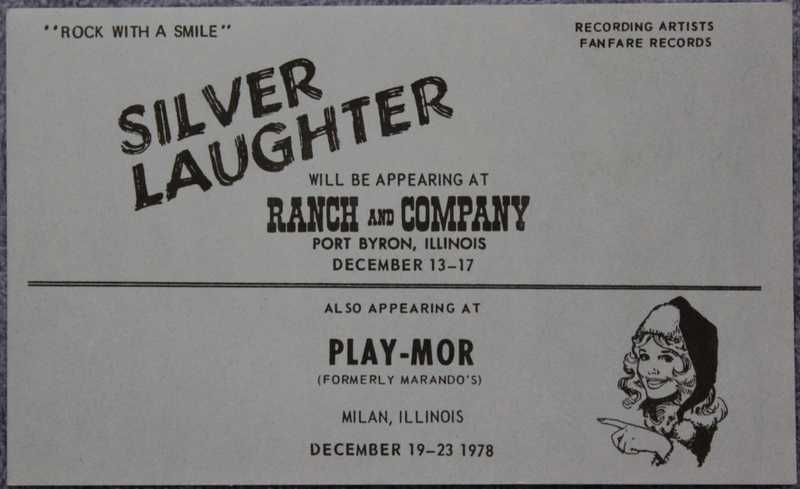 This card was for the date Silver Laughter played in Port Byron and recorded those two nights’ performances. Many of the cuts previously posted of our Beatles sets (and a few originals as well as other cover tunes) came from these shows. John Ludtke Sr. printed these flyers. Also, the Barr brothers owned both nightclubs; Gary ran the Ranch and Dennis ran the Play-mor. Thanks, Jon. At least I was HALF right! I was pretty sure the cards were the work of John, but didn’t realize the same people owned the the two nightclubs. Funny thing is, I only remember The Ranch. I have no memory of Play-Mor!! !